It’s that season where all those outdoor home and garden projects are underway or they are in your plans to be completed sooner than later. If one of those items on your list is better insulating your home; let’s talk exterior sheathing, which is now commonly known as continuous insulation. People are always looking at different ways to increase their energy efficiency and decrease their energy costs. So what do they do? Replace windows and doors. Well that’s a great start, but what about all that space between your windows and doors? Your walls? How much energy is leaving through your walls every day? My parents were always after me as a kid to shut the door and “stop air conditioning the outside!” In reality though, you could be losing up to 33% of your heating and cooling through your walls every day. So how do we fix this? Well this is where PlastiSpan insulation saves the day. It is more cost effective and time effective to increase your R-Value above grade by going from the outside in then from the inside out. Part of what makes PlastiSpan insulation great for this type of project is that it is easy to work with because it comes in both standard sizes, custom sizes, and because it is a rigid insulation, you can cut it to the size you need. PlastiSpan meets all building code requirements, has a long-term R-value of 3.75/ inch (which is an RSI of 0.65/25mm. It is simple, and easy to use. Below are some steps to take when insulating your home. 1. Check your local building code; see what they have for rules, requirements and restrictions. This will save you problems later on. 2. Figure out if you are eligible for any provincial or federal rebates and see if there are any requirements like a “blower door test” or an energy audit so you are able to show what you currently have and they can see the changes. 3. Now let’s get down to work. Once you have everything figured out for your rebate and building codes we need to buy the rigid insulation to increase your energy efficiency and decrease your costs. Your obvious choice of rigid insulation would be one of the following; PlastiSpan, PlastiSpan HD or Durofoam. b. PlastiSpan HD is also a more cost effective product then other rigid insulations. It gives you a slightly higher R-Value than PlastiSpan too. 5. Once you’ve removed all your existing siding you need to plan out the joints. 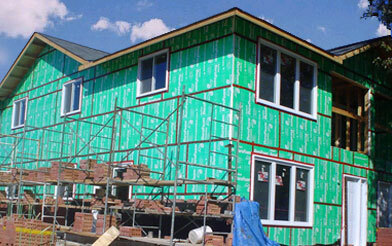 Apply one of the PlastiSpan insulation products over the exterior of the wood framing. All vertical edges of the PlastiSpan insulation need to be butted tightly together over stud locations for adequate support. 6. Here is an important step! Make sure you are using the correct fasteners. PlastiSpan Insulation board must be fastened to framing using fasteners with heads or washers at least 1/2” diameter where the cladding will be applied directly against the insulation. Fasteners with heads or washers at least 1” diameter must be used where an air space will exist between the insulation board and the cladding (e.g. brick cladding). 7. You will want to reference your local building code requirements to see if a sheathing membrane is required in your area. If so, you will need to install it at this step. 8. Now to install your exterior cladding. Cladding must be attached to the wood framing members so they need to be long enough to penetrate through the PlastiSpan insulation and at least 1” into the wood framing. Be sure to follow the cladding manufacturer instructions and building code requirements for installation of exterior finishing materials. 9. This should finish off the exterior of your house, new doors, new windows and by using PlastiSpan under your sheathing will make a huge difference on your energy bills every month and then both Federal and Provincial governments will give you money for making these changes. It’s a win win situation. By the way, don’t forget below grade insulation. Check out our Below grade insulation blog here. Let me know how it works out for you and how much money you are getting back! You may want to check you data. I believe the Energuide grant is dead. Thank you Ronn. That is correct. The Energuide grant ended in March 2012. Our apologies for the misinformation and thank you for letting us know it was there! I am looking for some info on window installation, I have been told that windows can be installed on the surface of durafoam by fastening through it with screws (no building out the opening). This is a new home construction in British Columbia and I need to clarify this and provide my building inspector and contractor with some reference that shows this is a acceptable process in BC. I would appreciate and help on this. Hi Rod, This is Sean from BC. That’s a good question. It is my understanding that the windows need to be built out with lumber to fasten the windows to.